At Medical audits we have a team of experienced healthcare professionals including Infection Prevention Professionals with decades of experience in preparing for and delivering HIQA inspections. In consultation with Medical Audits training division, we developed a train the trainer programme to suit our specific needs and resources. As hygiene services co-ordinator, I can say this course comes highly recommended . We realise the outcome of the training will have a hugely positive impact on cleaning services and the standard of cleaning throughout the whole hospital. 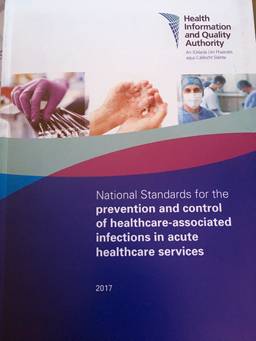 New HIQA recommendations (2017) require Infection Prevention and Control (IPC) teams to have detailed Infection Prevention plans that are prepared with reference to local quality and risk assessments, local audit results and surveillance data. We can come on site and work with you to teach you the skills to develop your own local Infection Prevention and Control (IPC) programme and plan. We will ensure you have the skills and a template so you can then update this plan going forward. We can assist with development of your Infection Prevention programme and advise on programme content and how to prioritise components of the programme based on local resources and local risks. We can teach you how to best evidence compliance with Health Information and Quality Authority (HIQA), Care Quality Commission (CQC) and Joint Commission International (JCI) standards. Indicators (KPIs). These include compliance audit results for practice such as Hand hygiene and Invasive device management as well as patient outcomes such as surgical site surveillance and blood stream infection surveillance data. We can assist you with ongoing prospective surveiilance systems. "HIQA’s role is to develop standards, inspect and review health and social care services and support informed decisions on how services are delivered"(HIQA, 2016). The Health Information and Quality Authority (HIQA) main aim is to ensure safe effective care, safeguarding service users and staff by assessing, licencing and guiding organisations to provide a safe and quality services where ever care is delivered. The Health Information and Quality Authority’s (HIQA) mandate extends across a specified range of public, private and voluntary sector services. "Setting Standards for Health and Social Services Developing person-centred standards, based on evidence and best international practice, for health and social care services in Ireland. Regulation– Registering and inspecting designated centres for disability services, elderly care and mental handicap services. Monitoring Children’s Services– Monitoring and inspecting children’s social service. Monitoring Healthcare Safety and Quality– Monitoring the safety and quality of health services and investigating as necessary serious concerns about the health and welfare of people who use these services. Health Technology Assessment– Providing advice that enables the best outcome for people who use our health service and the best use of resources by evaluating the clinical effectiveness and cost-effectiveness of drugs, equipment, diagnostic techniques and health promotion and protection activities. Health Information– Advising on the efficient and secure collection and sharing of health information, setting standards, evaluating information resources and publishing information about the delivery and performance of Ireland’s health and social care services"